In the middle, on the right: Mentality? who is obviously pregnant (she looks about 8 months pregnant) and sitting at the playground watching her 3 and 2 year old daughters, feels no shame or worry or regret about lighting up a cigarette? Why are Israelis so far behind the times that SMOKING WILL KILL YOU? That SMOKING IS BAD FOR YOU? That SMOKING CAUSES ALL SORTS OF HEALTH PROBLEMS? Not to mention what it can do to a fetus. It also upsets me to see pregnant women smoking. But this is what I think about: Maybe before she got pregnant, she smoked 20/day, and now she only smokes one. Maybe she smokes outside because it's less dangerous for her kids. Why should she care what others think? Would it be better if she regretted it, if she is going to smoke anyway? MiI, what I fail to understand is how or why ANYONE 40 or so and younger would be smoking at all. I'll be turning 38 next week and I don't remember a time when cigarettes didn't come with a health warning on the package. And as the years have gone by the warning label seems to just get bigger. And after living here for 12 1/2 years it seems that Israelis in particular ignore the health risks (never mind the law). 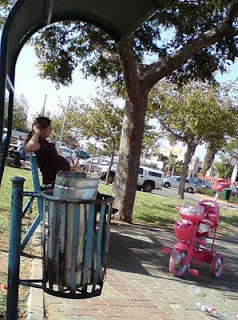 In this case, there's no law against smoking in a park, as far as I know, even if you're pregnant and have small kids. Sad! My mother smoked while she was pregnant with my sisters and I. He health was not good thoughout her adult life. I am glad that I found your blog. I must be by to visit again.